Are you looking for a WordPress plugin for adding a custom login page on your WordPress website? The login page acts as the door to enter your site’s backend and making it attractive and easy to use can be one of the primary ways to provide a unique user experience to your audience. Moreover, the WordPress custom login plugins will also let you add an extra layer of securities such as Google reCaptcha for preventing spammers and abusers to enter your WordPress admin area. Now let’s talk about the best WordPress custom login plugins that we have collected. These plugins are well tested and well managed (regularly updated) by their owners. Moreover, they come with stunning features to add beautiful yet secure custom login page on your WordPress website. WP Admin White Label Login is a premium WordPress login page customizer plugin for customizing your login page with the help of WordPress customizer option. It is packed with 25+ beautifully designed templates to choose the best login page for your WordPress website. Moreover, the plugin also offers tons of customization possibilities to customize your login page in an outstanding way. It is an ultimate WordPress plugin that supports image/video background. Besides, you can also add the Google reCaptcha on your login page for extra security. Moreover, you can also set the social media login to provide social oauth login feature to your audience. By doing so, you can allow your audience to login to your WordPress website using their favourite social media network. WP Custom Admin Login is another premium WordPress plugin to customize the login page. It is packaged with 25+ pre-designed templates to select the best matching login page for your WordPress website. Moreover, the plugin supports tons of customization possibilities to create a stunning and unique admin login page in no time. It is a fully customizer based plugin that comes with an intuitive interface for configuring your admin login page as per your preference. 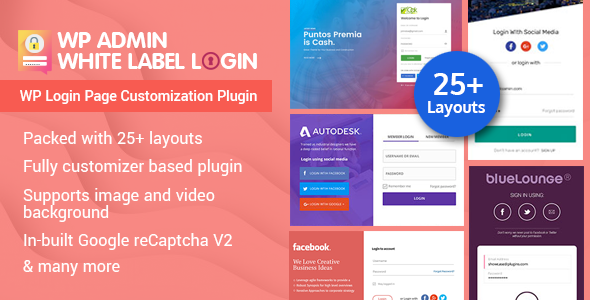 Moreover, the plugin also supports image/video background and 20+ social media icons for making your login page attractive as well as engaging to your audience. Also, the plugin supports social media login feature for letting your audience login to your website with their favourite social media network. 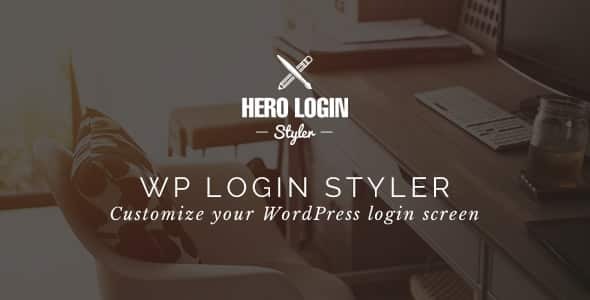 Hero Login Styler is one of the best selling custom login plugin for WordPress websites. It comes with sleek and professional design to add a styling login page on your WordPress website. Moreover, the plugin comes with endless possibilities to make your login page totally unique to the audience and provide them with the best user experience than ever. It is a user-friendly WordPress login page customizer plugin that contains easy and intuitive user interface. Besides, the plugin is fully customizer based and will let you edit your login page with a live preview. Also, you can add your own custom background and custom logo on the login page to provide the personal touch on the default WordPress login. 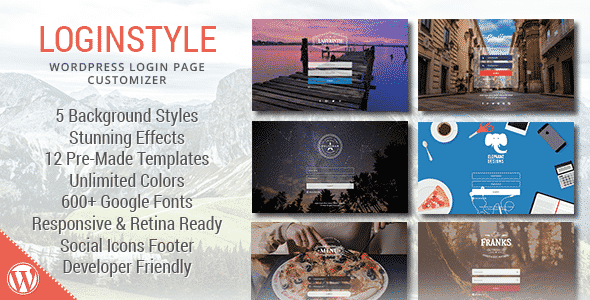 Loginstyle is a highly rated WordPress login page styler plugin. It comes with 12 premade login templates that can be installed on your WordPress website in a single click. Moreover, the plugin also contains 5 background styles that can be used for placing stunning background for your login page. Also, the plugin consists of various stunning effects to provide eye-catching animation effects. 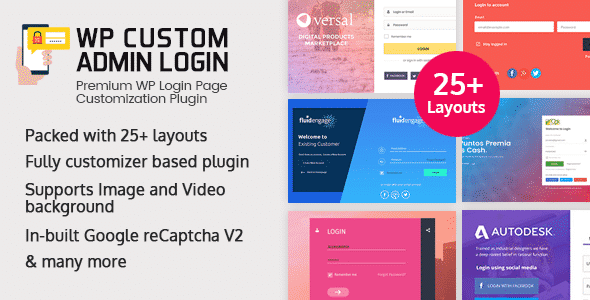 It is a fully responsive WordPress plugin to create a stunning login page that works well on all types of viewing devices. Moreover, you can also add social media icons on your login page footer as the plugin is packed with 150+ ready to use social icons. Besides, you can also add Google reCaptcha on your custom login page to provide extra security. 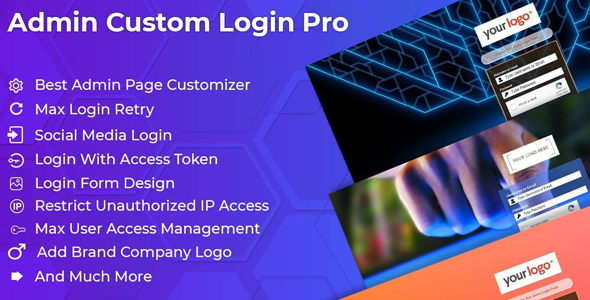 Admin Custom Login Pro is one the best WordPress admin page customizer plugin to customize your login page and form in the way you want. You can add your own custom logo, background and animation effect on your login page to provide a stunning user experience to your site’s visitors. Besides, you can also add a Google reCaptcha to prevent your login page with spammers. It is highly configurable WP plugins that contain endless possibilities to make your login page unique. Besides, you can also add social media outh login functionality on your login form. This will allow your audience to login to your WordPress website using their favourite social media network. 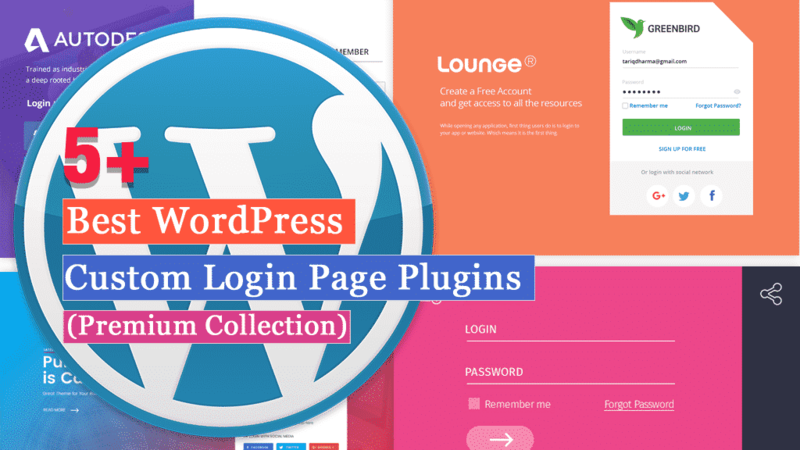 These are our handpicked collection of the best WordPress custom login page plugins. These plugins are collected as per its functionality, usability and popularity at the market. So, if you want to add a stunning custom login dashboard then, you can use any of the above-mentioned plugins at a reasonable price. Hey Buddy!, I found this information for you: "5+ Best WordPress Custom Login Page Plugins (Premium Collection)". Here is the website link: https://wpallclub.com/best-wordpress-custom-login-page-plugins/. Thank you.